Bladen County is located in southeastern North Carolina. It is a small, rural county with a population of about 35,000 people. The county seat is Elizabethtown. Established in 1734 as Bladen Precinct, was named for Martin Bladen, a member of England’s Board of Trade. Initially, Bladen County was a vast territory which extended far into central North Carolina; it was split into many different counties. It assumed its current shape in 1874. Because 55 North Carolina counties were once part of Bladen, it is sometimes called the ‘Mother County’. Despite the vast reduction in size, by land area Bladen is still the third-largest in North Carolina. Agriculture is the major industry, with peanuts and tobacco being its main products. There is also a small manufacturing segment. Politically, Bladen County can be described as ‘Blue Dog Democrat’. The most conservative Democrat in the General Assembly, William Brisson, hails from this county and most of his constituents share his views. The increasingly liberal views of the Democratic Party have alienated this rural constituency. Another Blue Dog who is liked in Bladen County is 7th District Congressman Mike McIntyre, who represents this area in the U.S. House of Representatives. Now, Bladen owes its Democratic nature solely to its high African American population. 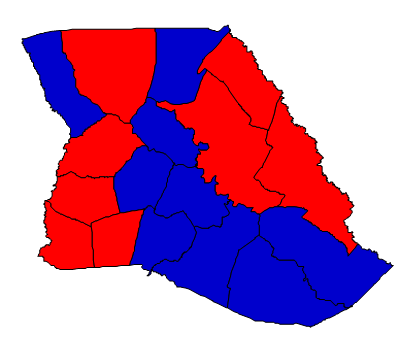 Low support from white voters contributed to Bladen being the closest ‘blue’ county in the state; Obama won it by less than 2 percentage points, a reverse of the state result. White voters are far more Democratic downballot; in 2010 Elaine Marshall carried Bladen by over 5. The last time Bladen opted for a Republican in a presidential contest was in 2004, when it was won by George W. Bush by 65 votes. Before that, it was in 1972 – Nixon over McGovern. Forecast: Bladen is a quite inelastic county. About 80% of whites supported Republican Mitt Romney in the 2012 presidential election. The African American community was near unanimous for Democrat Barack Obama. As evident from the changes in PVI above, Democrats have been on the decline in Bladen, almost entirely from losses among white, rural voters. In the 2000s decade, the county grew by 9%. A net decline in population is expected in the 2020 census. Blacks are declining as a percentage of the population; their increased registration in recent years has prevented further Democratic deterioration. Looking ahead, African American turnout will probably decline with Obama off the ballot, though a return to 2004 levels of turnout is unlikely. At the same time, the next Democratic nominee will probably see a higher level of support among whites. In the end, it should be a wash, which means Bladen will likely continue being a ‘swing’ county for the near future. Just don’t expect any visits from the presidential candidates any time soon. In non-presidential elections, Bladen’s Democratic status is much more secure. It backed Walter Dalton over Pat McCrory in the 2012 gubernatorial race. A Hagan loss here in the Senate race would be quite concerning, because it would indicate low African American turnout and a total collapse in her support from conservative Democrats.